There is plenty of awesome Capitals Stanley Cup Gear available via Fanatics and other sites, but this leather jacket takes the prize for the most amazing thing we’ve seen offered so far. It’s a bit understated, and we would understand if fans would prefer to wear something that yells “WE ARE THE CHAMPIONS!” a bit louder. While it probably won’t ship until July, it will be well worth the wait, and you will be the envy of the entire Capital One Arena when you roll into the 2018-19 season debut wearing this bad boy. 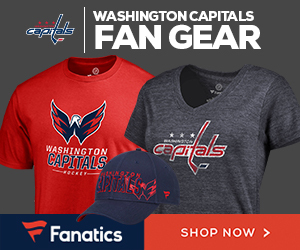 Click through to see what a bargain it is for such a beautiful souvenir of the Capitals Stanley Cup Championship. You’re definitely going to want to take it off before you go swimming in the fountain.